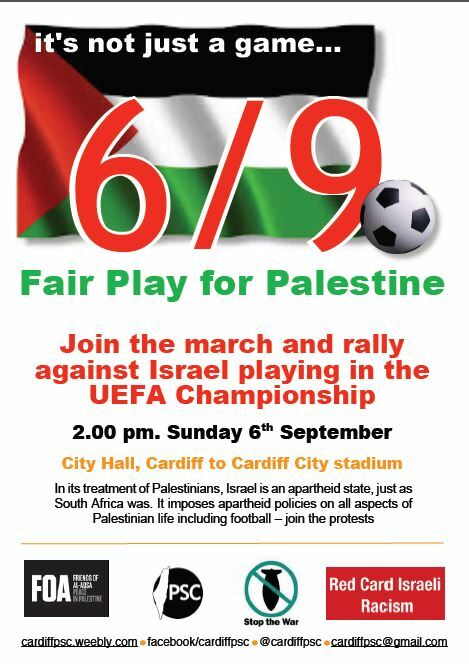 OBJECTIVES: (1) To pressure the Football Association of Wales (FAW) to support action against Israeli FA membership of FIFA and UEFA, and (b) to increase awareness of repression of Palestinians. Wales played Israel in the Qualifying Round of the men’s EURO 2016 competition. The away game was held on 28 March 2015, with a 3 – 0 victory for Wales. The home game was played on 6 September 2015 in Cardiff. The campaign was launched on 28th March with an open meeting in Cardiff . Speakers included long time Welsh activist Ray Davies, Baroness Jenny Tonge, Middle East Eye managing editor Ramzy Baroud, and three Easton Cowgirls from Bristol. Action in this campaign was led by Cardiff PSC (cardiffpsc@gmail.com) and Cardiff Stop the War (troopsoutcardiff@googlemail.com). RALLY AT HOME GAME ON 6TH SEPTEMBER 2015. This started at 2 pm with a march from the City Hall, Cardiff, to the Cardiff City Stadium. There was then a major rally until kickoff at 5 pm. PSC and FOA supported and buses were arranged for transport from other cities. On the 6th September almost 2,000 demonstrators marched from the centre of Cardiff to a major rally adjacent to the ground where the football match was to be played. Demonstrators arrived by bus and train from many parts of the UK and they were joined by several supporters from France. This was only the second time that the senior Israeli side had played in the UK. The Guardian also noted comments from a Zionist Federation supporter who wrongly painted anti-racism as anti-Israel and wrongly accused the speakers as liars – classical self delusion. Letters were sent to the FAW Board and International Committee members (25 in total) and also to players using twitter. These are given below. In a meeting with Cardiff PSC, the Cardiff West MP has expressed support for the idea of assisting Palestinian football more directly. We contacted the Football Supporters Federation (FSF) Welsh branch to ask for their support. .
On the 7th May last year we wrote to you to ask for your support for Palestinian football, both by giving direct support and by censoring the Israeli Football Association (IFA) for its complicity in the repression of Palestinian football. Since then, despite the verbal support of Sepp Blatter, there has been negligible progress. International travel by Palestinian footballers is still constrained, and racist actions by the IFA within Israel continue. Now, in the group stage of EURO 2016, Wales has been drawn against Israel. We do not believe that Israel should play in this tournament because of its widespread racism. We think that it is up to FIFA and UEFA to take action and suspend the IFA. This is what our campaign is fighting for and we urge you to support us in future. After your visit for the match on 28th March 2015 you and your squad will have the possibility of offering valuable direct support for Palestinian football. You could visit the Palestinian FA in Ramallah and discuss, for example, fixtures with Palestinian teams or visits by coaches to Palestine or visits by Palestinians to training camps in Wales. Please let us know what you plan to do in this regard. The Israeli government uses sport for political purposes to portray the country Israel as a “normal” European nation and to conceal its racist laws and actions. You may have the chance to witness this when you visit. Attached is our letter to your players, published on our website and distributed as far as possible by Twitter, which suggests various actions that they might take. The letter quotes precedents by Cristiano Ronaldo and Lionel Messi. (1, overleaf) Website letter to Welsh senior squad players. (2) Fact Sheet: Palestine, Israel and the Beautiful Game. In March and September 2015, you are likely to play Israel in the EURO 2016 competition. So we would like to alert you to the human rights dilemma you will face. Israeli sports teams, like Israeli orchestras and theatre companies, are used by their government to promote Israel as a “normal” country. Yet Israel is far from normal. Its racist government oppresses the Palestinians. World statesmen like Archbishop Desmond Tutu and former US president Jimmy Carter call it Apartheid, like in South Africa before boycott and sanctions brought it to an end. On the West Bank, Palestinians live under brutal military occupation. Border controls and hundreds of checkpoints stop or delay Palestinian footballers from travelling to away games and from representing Palestine abroad. In Gaza, the situation is even worse. 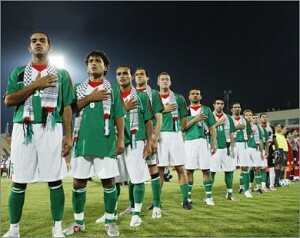 In September six Gazan players were stopped from going to play in the Peace Cup in the Philippines. It is almost impossible for Palestine to field its best team: a clear case of one FIFA member (Israel) preventing another FIFA member (Palestine) from playing. Israel has routinely destroyed sports facilities and injured, imprisoned, and killed players. Even youngsters walking home from practice have been shot and four young boys were killed by an Israeli shell while playing football on the beach in Gaza – you may have seen TV footage. Within Israel, 20% of the population is Palestinian in origin – people who survived the ethnic cleansing of 1948. They and their descendants are now second class citizens of Israel, subject to 50 discriminatory laws. In football, some teams are integrated: Jews and Arabs play side by side to appreciative crowds. But at a racist ground like Beitar Jerusalem, chants of “death to Arabs” are common. One of the Palestinian national team, Mahmoud Sarsak, was imprisoned for three years without charge. He went on hunger strike and was only released after an international campaign, which we helped organize, backed by FIFA and footballers like Eric Cantona and Frédéric Kanouté. Mahmoud can’t go back to see his family in Gaza. Our campaign, Red Card Israeli Racism (RCIR), calls ultimately for the Israeli FA to be suspended from FIFA and UEFA until Israel respects international law and Palestinian human rights. That means not playing international matches against Israeli teams. Our campaign is not anti-Israel, nor anti-Jewish, but we believe that isolating Israel in the football world will help put pressure on the Israeli government to stop repressing and collectively punishing the Palestinians. As players, you will be faced with a choice of how to improve this situation and keep the beautiful game from being damaged by racism. We’re not suggesting you don’t play – we’d like to see Wales win home and away. But you could do like Cristiano Ronaldo who famously refused to shake hands or exchange shirts with Israeli players; or wear a Palestinian shirt; be photographed with Palestinians; make statements to the local press; or take some other initiative. You could even take a tour of the West Bank to see for yourself. If you would like more information about the situation in Israel/Palestine, we would be happy to supply it. Please look on our website Red Card Israeli Racism or http://rcir.org.uk. We’d like to see Wales win home and away, but as players, you will be faced with a choice of how to improve this situation and keep the beautiful game from being damaged by racism. You could do like Cristiano Ronaldo who famously refused to shake hands or exchange shirts with Israeli players; or wear a Palestinian shirt; be photographed with Palestinians like Lionel Messi; make statements to the local press; not play against Israel; or take some other initiative. You could even take a tour of the West Bank to see for yourself.